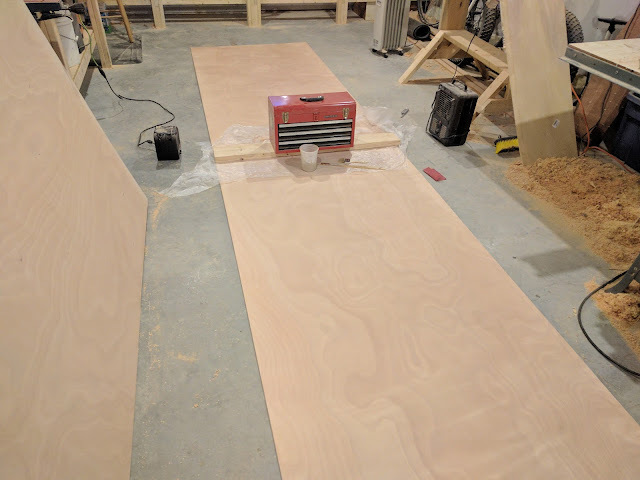 It's been a few weeks since I last posted; the call of the ski slopes kept luring me away from getting busy, but I will use the "it's too cold for epoxy" excuse for practical purposes. 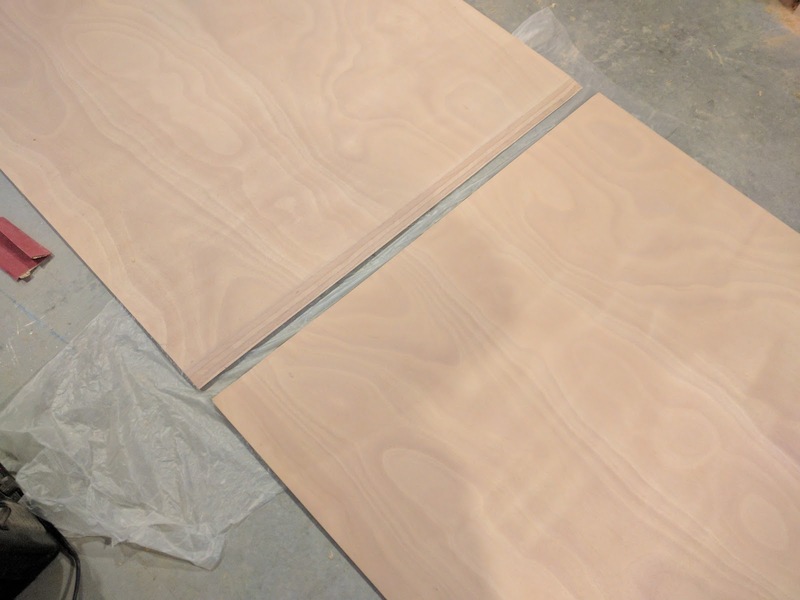 Fortunately, I finally managed to get over to Goosebay lumber and purchase six sheets of 6mm Okume marine plywood and had enough time this weekend to get to work on scarphing them together. Once these 6 sheets are glued together and diced up into appropriate shapes, they will provide enough wood for the basic hull to be built. 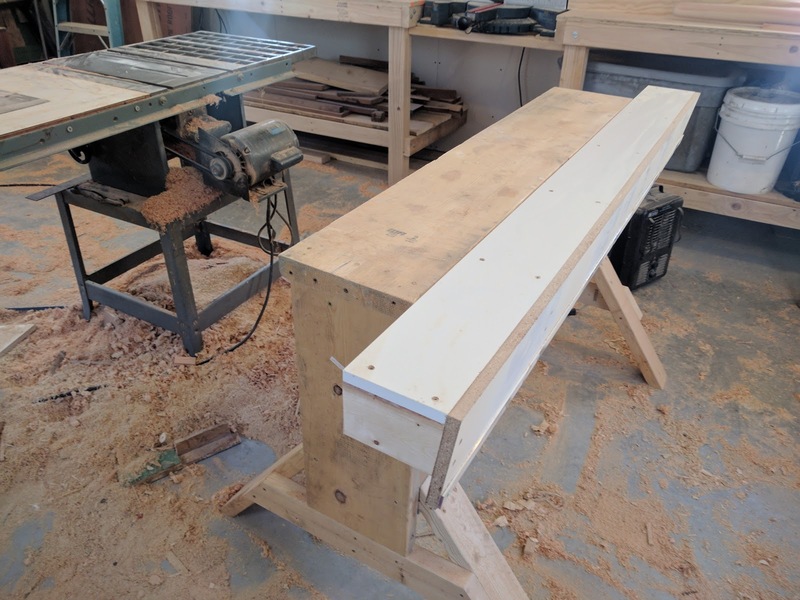 I have been pondering the scarphing part of the build since I purchased the plans earlier this year and spent what seemed like a huge amount of time researching the ideal method for accurately scarphing plywood panels. I say ideal because I mean 'best for me', not what may be the absolute best if time and money were no object. There are a ton of methods that range from simply using a block plane, to complicated router sled jigs and everything in between. 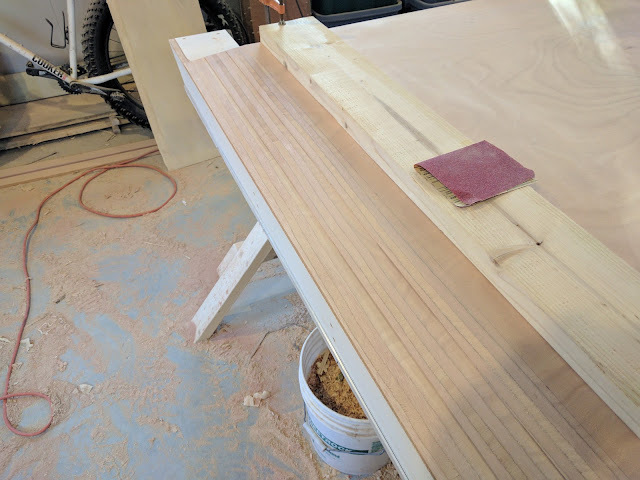 After weighing all the options I chose to go with a circular saw jig that combines simplicity in design with speed of cut once setup properly. 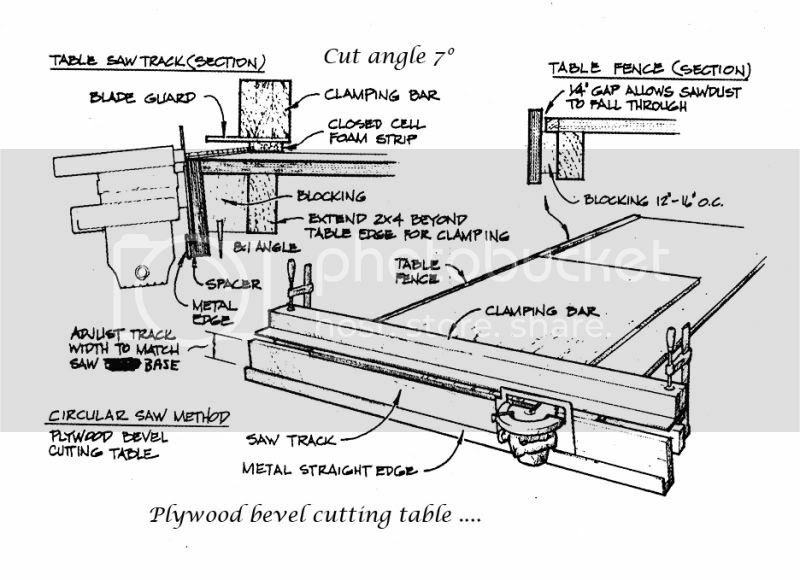 The design I chose is nothing more that a large bracket that clamps to my manning bench with an 82 degree face angle that allows a circular saw to ride along and cut the scarph at an 8:1 ratio. 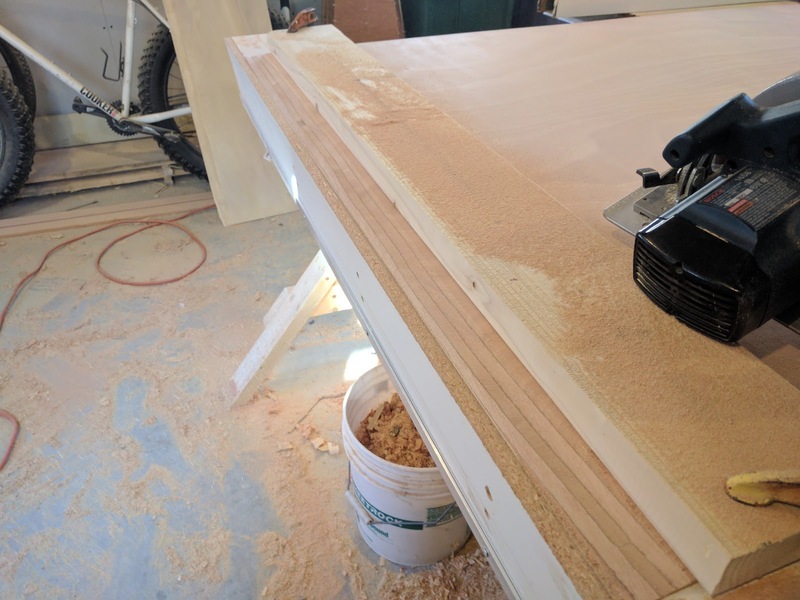 I constructed it out of 2x4s and some 3/4" Melamine shelving so the circular saw will slide along smoothly. The hardest part of building it was figuring out the blade offset from the fence so I could attach a metal rail for the fence to ride along. All of this is explained much better with pictures so hopefully they will give you the idea. Once completed I tried it out with a few pieces of 6mm test plywood to make sure everything was working as expected before I jumped in and started slicing up $75 per sheet plywood. All went well and was able to cut all six sheets in about 30 minutes. Next I stacked three at a time and hit them with my random orbit sander to clean up the cut so everything was nice and smooth and made sure they fit together nicely. To glue them up I had to clear out a space on the floor and then lay them out with a piece of plastic sheeting under the section I would be gluing up. I test fit the joint and then mixed up a small batch of epoxy slightly thickened with 404 filler and smeared it on both surfaces with a disposable brush and then 'clamped' them together by placing another sheet of plastic over the joint followed by a flat 2x6 and a 30 pound toolbox. After that it was just a matter of waiting for the glue to dry and then sanding the surface down before repeating two more times for each subsequent plywood pairs. Next up I'll sand down the glued joint to smooth everything out and then start marking out the strakes on the panels. I've never done strakes this big before, so I'll be taking my time to make sure I get all the measurements correct and then go back and double check before I cut a thing. Following your Apple build with great interest! That's an ingenious method for cutting a scarph, thanks for the diagram. 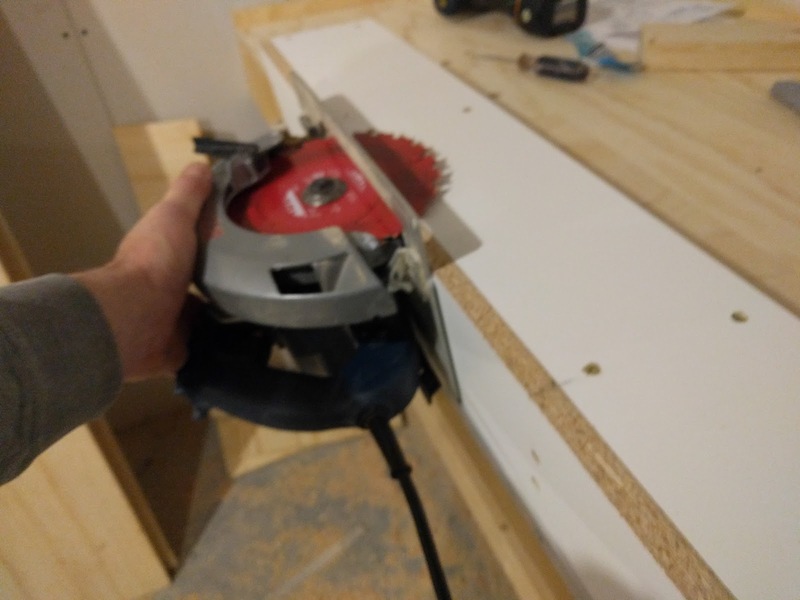 Last time I did a scarph, I used a belt sander, carefully drawn lines, and intense prayer. It worked, but I prefer your method.. Quicker and doesn't rely as heavily on guardian angels! I stole the idea and can't remember where I found it, but there are a lot of references out there to this method. I probably spent a lot more time building the jig than it would have taken to grind out the scarphs, but now I have the jig, so next build will be a simple matter. Once you strap the panel down it takes no more than 15 seconds to cut the scarph and another minute to clean them all up 'gang' style after they are all cut.